Tiger Woods’ return to competitive golf at the Hero World Challenge has become the talk of the sports world. Even his peers were excited. At least one golfer in the field asked on-course personnel for Tiger updates throughout his round. Woods is five strokes off the lead at the midway point. 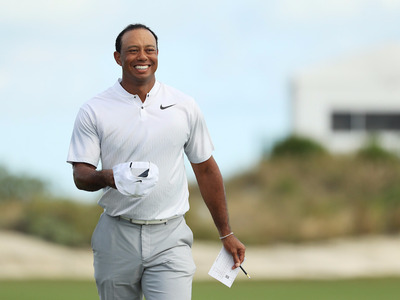 Tiger Woods’ return to competition has caused a stir among golfers of all skill levels, from weekend warriors to the best players in the world. After spending much of 2017 recovering from yet another back surgery, Woods circled this week’s Hero World Challenge as the site of his return. The comeback was sure to be a hit with the fans, but according to one player in the field, it was just as exciting for his peers on the course. The thought of Kuchar schmoozing PGA Tour staffers for a Woods update is a funny one, especially given the fact that he had his own round to focus on. That leisurely vibe is one of the perks of an 18-man tournament with no cut and a minimum payout of over $US100,000. With a World Golf Championship, a Players Championship, and an Olympic bronze on his lengthy resume, the 15th-ranked Kuchar is a star in his own right. But when it comes to Woods, even the foremost golfers on the planet turn into awe-struck admirers – perhaps because they understand just how difficult it is to dominate the game like he did. That’s especially true of the younger players in the field, nearly all of whom list Woods as a childhood idol.